www.AskDrEldritch.com -- Uncommon-Sense Advice for Extraordinary Situations! Don't fall victim to vampires! Don't get slashed by a psycho! Don't get stuck, ASK DR. ELDRITCH! My coworkers want to sacrifice me to a volcano because I'm a virgin! What can I do? It's rather embarrassing to be a 24-year-old male virgin, but I've been terribly busy at university. I had believed the rakish reputation of vulcanologists would attract women to me, but it turns out women actually fancy anthropologists. (I wish I had known that three years and fifty thousand dollars ago!) Anyway, I thought myself lucky to be chosen for a remote survey station on a tiny island in the Pacific. There's six of us, four men and two women, and we've been monitoring a volcano for the last three months. A week ago, it erupted! At first we were thrilled; we obtained some fabulous data. Then we realized that the lava flow has covered the only road. Before we could escape on foot, it surrounded the ridge we're on, trapping us here. We radioed for help, but the only helicopter for hundreds of miles is in pieces on a hangar floor and the mechanic is on a deep-sea fishing holiday! 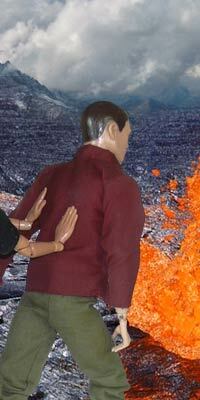 The lava's some fifty meters below us, but one good burst and we're history. We're all scared. Someone said, jokingly, that sacrificing a virgin was the traditional method of calming a volcano. Everyone looked at me. I'm not sure how they know (well, Tuesday last was Tequila Night, and I think we played Truth or Dare). Since then, there has been a lot of whispering and sideways glances in my direction, and I'm afraid scientific rationality may fly out the window in the face of rising lava. Please, how can we escape in a manner that doesn't involve tossing me into the crater? So why would beings with squishy, scaly or ethereal forms seek out female andromorphs? Simple. They do it to annoy us. Never underestimate the desire to perturb others as a motivator for bizarre behavior. For example, do you think teenage males wear the "if my pants were any farther south, they'd be migrating for the winter" look because it's comfortable or attractive? No, of course not. They do it for the same reason people get disturbing tattoos or a faceful of piercings; to annoy older conservative folks, especially their parents. The next time a car passes by that is emitting low-frequency thumping loud enough to rattle your teeth from a block away, know that the young person inside is risking long-term hearing loss merely for the pleasure of vexing those around him. You don't think they enjoy that music, do you? Your situation is actually a fantastic learning opportunity, one to potentially push back the Rising Tide of Ignorance (sorry, not a helpful metaphor). In this era of empowerment and equality, will a volcano be satisfied with a male virgin? Here's your chance to save your companions and advance Scientific Knowledge! Interested? No? I thought not. In that case, as a group, you should turn to devising a means of self-rescue. Theoretically you've got a set of fine, scientific minds (if you haven't ruined them with too many Tequila Nights or by licking rare tropical toads), so get cracking! It's not like one can just saunter out of harm's way at the first sign of trouble; these situations require going right up to the edge of disaster. Devise something desperate, foolhardy, even improbable, yet capable of a hair-raising escape. Perhaps all you need is to keep yourselves alive until you're saved in a daring, last-second rescue; just as the soles of your boots are melting from the heat of the rising lava, you are scooped up by the newly-reassembled helicopter. Do some brainstorming. You'll know you've got your plan when someone says, "the odds of that are a million-to-one, but it just might work!" And for insurance, find a quiet moment to implore one of your female cohorts to... well... make you not a virgin any more. If your companions threw you into the volcano after that, it would just be to annoy you. Good luck, and let me know how it comes out! (DISCLAIMER: Anyone intelligent enough to be reading this should understand 1) Satire, and 2) That following the advice given may result in physical, mental, or spiritual harm to beings living, dead, or undead. The author does not suggest that anyone other that the originator of any given letter follow his advice, and cannot be held liable if anyone else does. YOU ARE RESPONSIBLE FOR YOUR OWN ACTIONS! THINK FOR YOURSELF! DON'T DO STUPID THINGS THAT MAKE THESE DISCLAIMERS NECESSARY!